As front office service leader with Hotel Jen Orchard gateway Singapore, Ms Jasline Fong deals with guests from different parts of the world. The 27-year-old Singaporean believes she is an ambassador for the country, and strives to do more than just provide good service to guests. 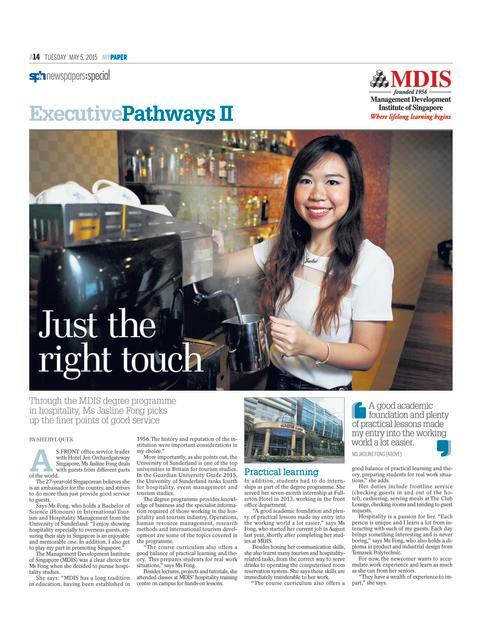 The Management Development Institute of Singapore (MDIS) was a clear choice for Ms Fong when she decided to pursue hospitality studies. More importantly, as she points out, the University of Sunderland is one of the top universities in Britain for tourism studies. 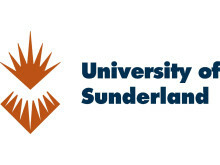 In the Guardian University Guide 2015, the University of Sunderland ranks fourth for hospitality, event management and tourism studies. The degree programme provides knowledge of business and the specialist information required of those working in the hospitality and tourism industry. Operations, human resource management, research methods and international tourism development are some of the topics covered in the programme. “The course curriculum also offers a good balance of practical learning and theory. This prepares students for real work situations,” says Ms Fong. Besides lectures, projects and tutorials, she attended classes at MDIS’ hospitality training centre on campus for hands-on lessons. In addition, students had to do internships as part of the degree programme. She served her seven-month internship at Fullerton Hotel in 2013, working in the front office department. “A good academic foundation and plenty of practical lessons made my entry into the working world a lot easier,” says Ms Fong, who started her current job in August last year, shortly after completing her studies at MDIS. tasks, from the correct way to serve drinks to operating the computerised room reservation system. She says these skills are immediately transferable to her work. “The course curriculum also offers a good balance of practical learning and theory, preparing students for real work situations,” she adds. Her duties include frontline service (checking guests in and out of the hotel), cashiering, serving meals at The Club Lounge, checking rooms and tending to guest requests. Hospitality is a passion for her. “Each person is unique and I learn a lot from interacting with each of my guests. Each day brings something interesting and is never boring,” says Ms Fong, who also holds a diploma in product and industrial design from Temasek Polytechnic. For now, the newcomer wants to accumulate work experience and learn as much as she can from her seniors. “They have a wealth of experience to impart,” she says. Source: My Paper, 5 May 2015 © Singapore Press Holdings Limited. Permission required for reproduction. Click here to view PDF.